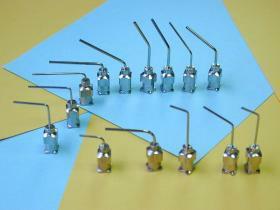 Profession Technology specialize in Rigid Precisely bent, burr free, electro polished, stainless steel tips. Fro 1/2” up to 12” lengths in various bend angles. Bended in 45 degree, 60 degree, 90 degree, 130 degree or any custom angle as desired.